If you have Mexican ancestors, who like mine, immigrated to the United States in the late 1800s or later, you spend a lot of time looking for and at border crossing records. Finding your ancestors’ records and getting the most out of the data captured in those records can sometimes be a challenge. 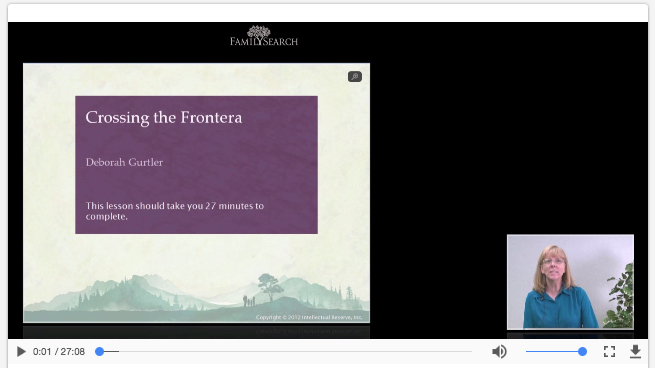 This excellent FREE webinar by my friend and colleague Debbie Gurtler, AG®, of FamilySearch is an invaluable source for maximizing your time working with these border crossing records. I frequently refer back to this webinar for reminders, and I make it required viewing the graduate-level MLIS/U.S. genealogy course I teach each summer. Although this webinar is a few years old, the information covered is still current. Debbie starts off with a timeline of when border arrivals from Mexico to the U.S. started being regulated and documented. She explains where to find the records (digitized images as well indexes) and how the records are indexed and organized. She describes the various types of border crossing records and the type of information captured, and also highlights how to use clues from those records to find relevant records in Mexico. Debbie illustrates these strategies using a case study. A helpful handout is included.